Note: this is a long article and can be downloaded as a PDF here. Tableau is without doubt the highest profile visual analytics platform. This is due in the main to excellent sales and marketing, and a good understanding of the frustrations and desires of millions of business users around the world. Tableau promises analytical nirvana for people who have neither the time nor inclination to acquire new skills, making the task of creating charts, graphs, maps and dashboards, as easy as dragging items around a graphical display. The “ease-of-use” mantra is an old, and very successful message, appealing to users who are new to a technology. It worked for Oracle way back in the eighties when it introduced its relational database products , and it still works today. However this messaging only works for so long, simply because the collective skills of users improve and they start to want something more sophisticated. And so it is time for Tableau to decide where it wants to go – greater sophistication, or easy-to-use consumer type products. It cannot sit in the middle ground – the market is maturing and new suppliers are appearing with innovative approaches that offer greater sophistication. Tableau is also being squeezed. On the one hand Microsoft with its Power BI platform is squeezing from below, and established players such as TIBCO with Spotfire are squeezing from above. The ease-of-use positioning, while still attractive, is now a feature of many visual analytics platforms. The choice for Tableau is fairly straightforward – move to higher ground, to lower ground, or try to span both. However the market dynamics that dominate fashion driven technology markets may mean that Tableau continues its rapid growth regardless of the strategy it adopts. The virtuous positive feedback loops that drive IT markets mean that the more people use a product, and the higher its profile, the more others will want to use it. Personal biases driven by the need to acquire skills in a popular technology means these technologies have a head start in any product selection process. Tableau has this tail wind pushing it along, and it may come to pass that everything else is irrelevant. Overall I think Tableau will continue to be propelled by this virtuous tail wind, but it does face serious competition from Microsoft, and as skills and experience increase so some users will start to look at more sophisticated analytics platforms. Tableau is Tableau Software’s platform for visualizing data. What this means in practice is that business users and others can display data held in databases, spreadsheets and other data sources, as graphs, charts, maps and dashboards. This visual representation plays to our ability to quickly recognize patterns represented on graphs and charts, and is orders of magnitude more productive than interrogating traditional paginated reports containing tables of data. The Tableau platform can be installed on a PC or Mac for personal use, or on a server for enterprise deployment. A cloud option is now available, and for a fuller discussion of the technology go here. The company was founded in 2003 by Chris Stole, Christian Chabot and Professor Pat Hanrahan, who commercialized the work carried out at Stanford University’s Department of Computer Science. This work was largely concerned with the visualization of large amounts data held in databases, and resulted in the creation of a language called VizQL (Visual Query Language). The company launched an IPO on May 17, 2013, and has seen rapid growth since. However in February 2016 the price of the stock halved when the company forecast disappointing growth and earnings figures. The primary focus for Tableau is to make visual analytics as simple as possible. In fact the term visual analytics has a special meaning for Tableau. It means that the creation of visual artifacts should take place using a wholly visual interface. There is no scripting language in Tableau, only visual items that can be dragged and dropped and selected as needed. This is both a strength and a weakness. This theme has been reinforced by the introduction of Vizable late 2015. As a free data visualization tool for the iPad, Tableau is clearly targeting everyone who might have data they wish to view in charts and graphs – students, professionals of all kinds, small business owners – anyone with data. It’s a good seeding exercise, but unlikely to contribute to growth in the short term. Despite the emphasis on technology innovation, the meteoric growth of Tableau is largely down to marketing and sales. This is not a unique phenomenon, and it is well known that effective marketing will always trump superior technology. There are many examples of large, successful technology businesses whose technology underperforms and is overpriced, but are successful because of effective sales and marketing machines. And it should be remembered that business focused technology markets are often quite unsophisticated. Business people are after all primarily interested in their business, and are not technology experts. With the continued drift of buying power moving away from the IT department to business departments, so the market for technology becomes even less sophisticated. Tableau’s main marketing message revolves around ease-of-use, and the creation of attractive visuals with a minimum of effort. This is obviously attractive, appealing to business professionals who want to have direct control over their data and how it is used. There has been a tsunami in the making, since previous generations of business intelligence technologies have suffered from high latency between need and fulfillment, expensive infrastructure, and less than appealing output formats (tabular reports in the main). And so the frustrations have mounted, and the promise of do what you want, when you want it, appealed to a primed audience of frustrated business users. A number of factors conspired to make self-service business analytics a reality. The Cinderella in this story is hardware, and particularly the availability of cheap memory and powerful processors. This means that data can be held in fast memory, orders of magnitude faster than disk based data. Powerful processors also mean that data can be aggregated, joined and transformed at speeds compatible with sophisticated visuals. This has allowed the use of in-memory columnar databases for the slicing and dicing of data previously enabled through expensive data warehouse technologies. As memory continues to fall in price so the amount of data that can be handled by these columnar databases continues to grow. What this means for the user is that the scope of self-service, ad-hoc visual analysis continues to grow. It all sounds quite rosy, but there are a number of downsides in all of this, and they will affect how this market for visual analytics develops. Because self-service visual analytics appeal very much to the individual and business department, so the appearance of islands of information is inevitable. This is the age-old swing between centralization and democratization – and it is very difficult to get right. The net effect is that the pendulum swings between these two extremes. Centralization results in inflexibility and high latency. Democratization can lead to analytical chaos with no single version of the truth and proliferation of technologies. During 2015 the suppliers of visual analytics tools became aware that this was a growing problem, and started to emphasize the governance aspects of their technology – control over security, authorization, resource allocation and other related issues. This was largely to placate the concerns of the IT department, since business users generally do not want any controls imposed by IT. As such the main marketing messages are still focused on the ‘anything, any-time’ mantra. But the pendulum will inevitably swing back to greater centralized control as business users start to flounder in a self-made analytics chaos. What once appeared attractive may start to look increasingly immature, and Tableau will have to change its messages to appeal to a maturing market. There is also another issue that needs to be considered. Visual analytics is largely subjective in nature. Give a graph or chart to ten people, and ten interpretations will probably result. The fact that tens of thousands of businesses are making decisions based on such subjective interpretations is food for thought. This lack of rigor is already being anticipated by companies such as BeyondCore and TIBCO with its Spotfire platform. BeyondCore is especially advanced, only displaying charts that have some level of statistical significance. While Tableau will display some levels of statistical significance on appropriate charts, there is no guidance as to what makes sense and what does not. If Tableau is to maintain its momentum it will need to do much more in this area, although it might create a clash in the messaging. The empowerment of business users, something that is central in Tableau’s messaging, might not sit easily with the need for greater governance and automated checks on the validity of analysis. While Tableau has the highest profile of all visual analytics platforms, from a technical perspective it is equalled by many other platforms. Qlik, Spotfire , Microsoft Power BI, Sisense and several others (to be mentioned later) all offer similar capabilities. In fact Tableau is being squeezed from the bottom by players such as Microsoft and Amazon with its QuickSight technology, and from above by players such as Spotfire and BeyondCore. One of the less obvious strengths of Tableau is the fact that it has been adopted by several business analytics suppliers as the data visualization front-end. These include Datameer, Angoss, Birst, FICO and Alteryx. Lacking any competitive front-end of their own, these businesses offer Tableau as part of their own package of technologies. As such, tableau becomes part of the furniture, and part of a larger analytics effort. Technology markets are similar in many ways to fashion markets. The more people do something the more others want to do it. This is very true of technology, where virtuous positive feedback loops drive much of the market activity. The more Tableau is used, the more job opportunities become available, and the more incentive there is for users to acquire Tableau skills. More than any other visual analytics supplier (with the possible exception of Microsoft), Tableau has these dynamics working in its favor – and they should not be underestimated. Business IT markets are largely driven by a ‘me too’ mentality, and this is the stuff that creates industry giants. It is perhaps Tableau’s greatest asset, and played correctly will drive the growth of the company. The Tableau user community is characterized by a level of religious zeal that is quite exceptional. At a recent product announcement a large crowd of users became ecstatic when it was announced that subtotals and totals in a table would automatically assume a different color. This is a direct result of the very powerful marketing messages put out by Tableau and the fostering of a level of commitment that is well beyond the norm. It also results from the fact that many users feel empowered by Tableau. The visual analytics market is still very immature. In reality visual analytics is just a small part of the overall analytics process, and is usually the start of the journey. Once insights have been uncovered, then there is a need to validate them and implement any necessary changes. The process becomes more involved and difficult as it progresses, and the real breakthroughs in business analytics will come when these additional processes become easier to execute. Every business analytics technology supplier is aware of this, and as the market matures so visual analysis will assume a relatively minor part in the overall process. Eventually we will see the formation of business analytics ‘giants’ in the same way Oracle and SAP are the business process giants. Market dynamics are very much in Tableau’s favor at the moment, but it is being squeezed from above and below. These two conflicting dynamics will resolve within the next couple of years, and either Tableau will evolve out of its ‘squeeze’ or it will fail to adapt and become something of an ‘also-ran’. Microsoft Power BI – Prior to 2015 Power BI was essentially a set of Excel add-ons with cloud based data sharing and collaboration. Excel aficionados loved it – and no one else did. This all changed in 2015 when Microsoft introduced what is now called Power BI Desktop and the cloud based Power BI Service. Power BI Desktop sits on a Windows PC and allows users to access various data sources and create visualizations. It even has a natural language interface. It is very easy to use, and sharing takes place via the Power BI Service. Despite the superficial similarity to Tableau, Power BI is part of a much broader analytics offering from Microsoft. This includes several cloud database offerings, streaming data support (real time dashboards), machine learning, and of course SQL Server with its various analytical capabilities. As always for Microsoft, its real strength is its installed base. Millions of businesses use Microsoft products and Power BI is a natural route for them. Power BI does operate outside the Microsoft stack, but loses much of its power. 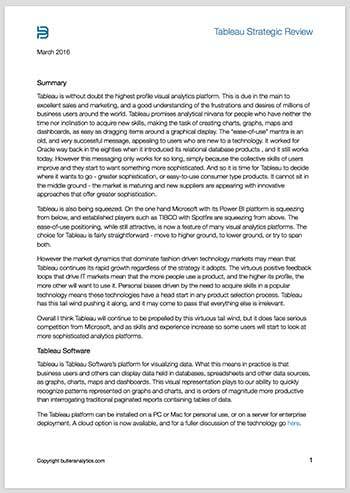 Tableau on the other hand is platform agnostic to a large degree. Power BI is a threat to Tableau, and as it matures and gains momentum, so it will start to eat away at some of its market. Qlik – Two products are offered. Qlik View is more of a production oriented BI platform, allowing developers to create reports, charts and dashboards that are used on a regular basis. It does have some self service capability, but certainly does not compete with Tableau in this respect. In 2014 Qlik introduced Qlik Sense. This was targeted as direct competition to Tableau and comes with the same ease of use features. However Qlik is endowed with a very clever associative data engine that understands the relationships between data. It is also very extensible, meaning new chart types, data sources and other functionality can be added if needed. Tableau is quite weak in this respect. However Qlik Sense does not offer any form of advanced analytics and its pricing structure is often a source of confusion. Right now Qlik is a major competitor for Tableau. Qlik does however need to embrace more advanced forms of analytics, and provide more information on the significance of the various graphs and charts. If it remains as it is, then it seems likely that Tableau will continue to take the larger slice of the pie. Spotfire – This is perhaps the most significant threat to Tableau for a number of reasons. Spotfire underwent a major revision in version 7. The ease-of-use factor that propelled Tableau had to be matched, even though Spotfire is a much more sophisticated product. This was achieved in version 7, and so users can build charts and dashboards pretty much as they would in Tableau, but as needs and skills develop, they can move on to more rigorous forms of analytics in a seamless environment. And since Spotfire comes from TIBCO, there is a broad infrastructure available to move from insight to action – something missing is most other visual analytics platforms. The marketing styles of the two companies could not be more different. Tableau markets everywhere and to everyone. Spotfire assumes a very low profile in keeping with the style of TIBCO. If technical capability was the only criterion then Spotfire would be the platform of choice in most large businesses. Sisense – This is a lesser known competitor for Tableau, but after recently raising US$50 million in funding, the profile is starting to build. Sisense majors on speed of execution, scalability and the ability to handle rich, complex data. Users like the easy to use interface and the lightening fast responses – due in main to the fact it exploits computer hardware is some unique ways. 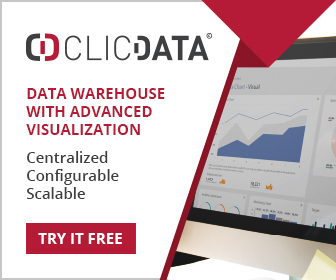 It offers similar functionality to Tableau, but is more extendible, and typically requires fewer infrastructure resources. This is one to watch, and will definitely eat away at some of Tableau’s market. The four products mentioned above are the obvious immediate threats for Tableau – Microsoft from below, Qlik Sense and Sisense immediate competitors, and Spotfire from above. However this a dynamic market with new entrants appearing by the month. ThoughtSpot for example uses a search based interface similar to a Google search, and delivers visualizations based on the results of a search. This is a different paradigm and could easily eclipse the current drag-and-drop visual interface that is commonly used. BeyondCore anticipates the need for greater rigor in visual analytics, and employs both machine learning and regression techniques in the background to identify meaningful patterns. These examples are given to illustrate that Tableau cannot simply do more of the same if it is to remain current and competitive. Some of the larger suppliers such as Microstratgey and IBM Cognos are not really competition for Tableau, and they could be viewed as complements. A number of cloud based data visualization platforms do compete, including GoodData and Yellowfin. In summary Tableau is fighting against an ever increasing number of incumbents , and the only way for it to maintain its competitive position is to innovate in a significant manner. This implies R&D spend, which at the current time might not go down well with investors, since they (as always) are looking for a strong bottom line. One of the most obvious things that could happen to Tableau is acquisition (by IBM or Oracle for example), especially at the moment while its share price is low. If that happens then the rest is irrelevant. Assuming that doesn’t happen any time soon, then Tableau will need to adjust to this developing market in the same way all other players will have to. So the first step is to consider how the market for visual analytics is likely to develop over the next five years or so. The dominating strategy used by Tableau is that of making the software easy to use. This mantra is applied to all modes of analysis, and new features such as clustering are dominated by this approach. The strategy is predicated on the fact that most users have no training in analysis and so the platform has to be smart enough to do things well without asking too many questions. Take clustering for example. Users typically need to understand how many clusters they should be pitching at. Tableau works this out for the user as best it can. This strategy makes one important assumption – that user skill levels will remain at their current levels. Typically this does not happen. A good example is the introduction of relational database technology in the eighties. Oracle too came to market with an ‘ease-of-use’ mantra, and as history shows, it worked very well. But Oracle had to incorporate greater levels of complexity into its database product to accommodate growing user needs. The same is happening with visual analytics. Right now many users are satisfied with the fact they can see their data at all – but it won’t last very long. 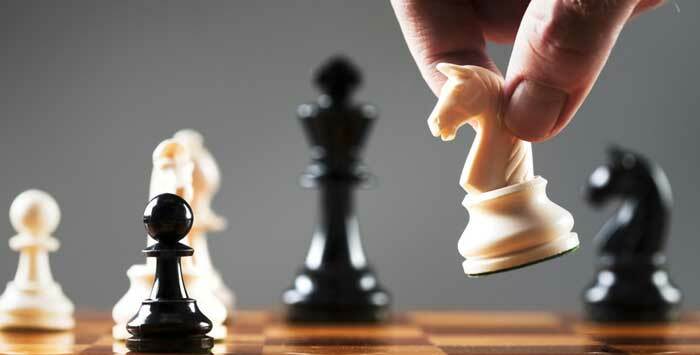 Greater sophistication will be demanded, along with the ability to create bespoke analytical solutions. So it is my contention that the ‘keep it simple’ approach will become increasingly inappropriate. The introduction of Vizable, the free iPad app, possibly points to the fact that Tableau may decide to move to lower ground and make their products something of a consumer item, in much the same way Excel is. As well as acting as a seeding mechanism Vizable also allows Tableau to test the market demand for a consumer data visualization product. Certainly, the Tableau drive to make visual analytics as simple as possible would tie in very nicely with a commodity type product. Of course it becomes more difficult to ask hundreds of thousands of dollars for a product that also comes as a low priced consumer item, and the recent drop in share price was partly motivated by the apparent resistance of Tableau’s customers to substantially upgrade. Increase product sophistication with extensibility options, more advanced forms of analytics, and greater in-built intelligence. New players are delivering products of this nature (e.g. BeyondCore), and so there is some level of urgency associated with such a move. Focus on less sophisticated consumer style markets – “putting a data visualization tool on every desktop”. This assumes there is a need for such a thing, and that users are sufficiently dissatisfied with drawing simple charts and graphs in tools such as Microsoft Excel. Try to span both worlds – the consumer products acting as a seeding mechanism, while also offering enterprise solutions. This could backfire badly and would be a high risk strategy, resulting in Tableau satisfying neither of these markets. I have already mentioned that Tableau’s main asset right now is the positive feedback loop associated with being a market leader in an IT market. Procurement of technology becomes biased due to personal preferences, and specifically the desire to gain experience and skills in a popular technology. If this dynamic continues to build then the market for Tableau may continue to grow simply because of these dynamics – regardless of what strategies the company employs.